MSF calls on the stakeholders of the Global Fund to convene an emergency donor conference and to open a new early funding window to ensure that the Fund is fully functional in 2012. Doctors Without Borders/Médecins Sans Frontières (MSF) calls on the stakeholders of the Global Fund to Fight AIDS, Tuberculosis, and Malaria—including its donors, Board of Directors, and Secretariat—to convene an emergency donor conference and to open a new early funding window to raise the necessary resources needed to ensure that the Fund is fully functioning and open for business in 2012. Countries simply cannot wait two years to access new funds to scale-up and improve lifesaving treatment programs. For its part, the United States must also ensure that funding for US President’s Emergency Plan for AIDS Relief (PEPFAR) is preserved and that the commitments for scale-up of HIV treatment are met. European Commission and European Union member states must boost their financial support, and affected country governments must make all efforts to increase scale-up of HIV and TB services. In the decade since Médecins Sans Frontières (MSF) began providing antiretroviral treatment (ART) to people in urgent need of treatment, MSF has witnessed time and again how treatment dramatically reduces illness and deaths in the communities in which we work. We are in an historic time in the fight against HIV/AIDS. Thanks to scientific research on the benefits of expanded ART, we now know that if treatment providers take certain specific steps—known collectively as “accelerated treatment”—and combine these with proven prevention strategies and medical interventions such as medical circumcision, we have an excellent window of opportunity in the next several years to stem and even reverse the AIDS epidemic. Such is the promise of accelerated treatment that in June 2011, at the United Nations High-Level Meeting on AIDS, countries set a target to increase the number of people on HIV treatment to 15 million by 2015, from 6.6 million today. Late last year, the United States made the goal of “turning the tide on AIDS” official government policy, placing implementation of accelerated treatment at the core of HIV/AIDS programming. Many affected countries too are making plans to implement important components of accelerated treatment, such as earlier, improved treatment and expansion of programs to prevent mother-to-child transmission of the virus (PMTCT). But while the latest scientific knowledge shows us what needs to be done, and countries have pledged to turn the promise into reality, the funding needed for accelerated HIV treatment is simply not being made available. Furthermore, international commitments to scale up treatment of both drug-sensitive and drug-resistant tuberculosis (TB) remain far from adequate. Faced with a serious funding shortage after a disappointing replenishment conference and after donors scaled back their pledges, the Global Fund took the unprecedented step in November 2011 of cancelling a round of funding grants. Without "Round 11," no new grants for scale-up will be disbursed until 2014, leaving countries unable to aggressively tackle their epidemics. The "Transitional Funding Mechanism," created to cover essential needs and prevent disruption of existing programs until 2014, does not include money to support starting new patients on HIV or TB treatment. This crisis is occurring in an alarming context of declining funding for Global HIV overall. For the second time in two years, global funding for HIV has been reduced even though it is clear that poor countries do not have the resources to fill these vast funding gaps on their own. PEPFAR—which combined with the Global Fund accounts for 84 percent of all HIV treatment in the developing world—is facing similar cuts. Despite promising to add an additional two million people on treatment in the next two years, including 40 percent more next year, PEPFAR funding will be cut by 12 percent, according to President Obama’s proposed 2013 budget. Other bilateral donors, including EU member states and the European Commission, are reducing HIV treatment support, expecting the Global Fund to take on more costs of HIV programs even though total pledges from Europe to the Global Fund have dropped from one replenishment to the next. The World Bank’s Multi-Country HIV/AIDS Program and UNITAIDs pediatrics and second-line ARV programs are also shutting down or phasing out. Accelerated treatment means taking heed of the latest science, which shows that providing ART early can reduce sexual transmission of the virus by up to 96 percent. In practice, it means starting people on treatment earlier—before they get very sick—and with better first-line medicines in line with World Health Organization (WHO) recommendations. Proven prevention strategies and medical interventions, including those used by MSF in treating people in developing countries over the last decade can, experts believe, stop the epidemic in its tracks. Time is of the essence, to save lives, but also to prevent costs from spiralling of control—as reflected in UNAIDS advice "pay now or pay forever." This briefing document is limited to identifying and describing the impact of funding shortfalls in critical areas of HIV and tuberculosis. TB is a leading cause of death by infectious disease after HIV5, and the leading cause of death of people living with HIV, with up to 1.5 million deaths per year. With multidrug-resistant forms of TB (MDR-TB) on the rise in Eastern Europe, Central Asia, and Africa, adequately addressing MDR-TB requires more investment, with needs escalating from US$1.3 billion in 2010 to $4.4 billion in 2015. But the means available are woefully inadequate, with the Global Fund supporting TB this year to the tune of $362 million, and only $86 million expected from other donors6. The cancellation of Round 11 means countries with high rates of HIV/TB co-epidemics will be unable to increase diagnosis and scale-up treatment, grossly neglecting what should be a key component of ending sickness and death caused by HIV. In such a grim funding landscape, many country plans must be curtailed or have been put on indefinite hold. MSF field teams are witnessing countries such as Malawi, Mozambique, Uganda, and Zimbabwe delaying or dropping ambitions to implement strategies for accelerated treatment, including those set out in the recommendations from WHO that are needed to get ahead of the wave of new infections and mitigate the impact of the epidemic on communities and livelihoods. MSF doctors see how in countries where ART is already extremely limited, such as the Democratic Republic of Congo and Myanmar, where coverage is under 25 percent, initiation rates are being capped and treatment is rationed. MSF projects are concerned that plans to scale up TB treatment in countries such as in Uzbekistan risk being shelved. This issue brief illustrates findings of a survey of 13 countries where MSF supports HIV and TB treatment projects. It shows some of the critical areas in which the cancellation of Round 11 are already having an impact on the ability of high prevalence countries to implement the latest, most promising strategies to combat their epidemics. A decade into the global fight against HIV, the benefits of scaled-up treatment are abundantly clear. Treatment not only saves lives, it has a direct impact on overall costs of care due to lower rates of illness and sickness. There is also a massive societal impact. When you treat one person, the latest research has found, you are helping to ensure that his or her partner will not contract the virus, helping to reduce transmission rates, keeping people healthy enough to work and contribute to their community, and keeping parents alive to care and provide for their children and families. An estimated 15,000 people are already on the waiting list for HIV treatment in the DRC, and 300,000 are projected to be in need of ART nationwide. Lack of access to timely ART leads to higher morbidity and mortality. By the time patients arrive at MSF-supported clinics, which treat approximately 5,600 patients throughout the country, they are often extremely ill and struggling to overcome medical complications reminiscent of the pre-ART era, which have become rare elsewhere in sub-Saharan Africa. Due to funding shortfalls for Global Fund grants, in 2011 only 2,000 additional patients started ART nationwide, one-fifth of the previous year’s total. Because of the uncertainty around continued funding in the next few years, treatment providers are reluctant to initiate treatment because funding for drugs to treat those found eligible for ART is not assured. The DRC’s treatment targets using existing Global Fund grants have been revized downwards—the initial aim of reaching 82,000 people by the end of 2014 will potentially be reduced by as many as 28,000 people. PEPFAR support excludes ART treatment in DRC, except for some pregnant women enrolled in PMTCT and only for a limited period of time. In the wake of low donor funding, new rules were put in place to limit funding applications and, as a result, Guinea became ineligible for Round 11 funding. Guinea’s current Global Fund grants do not go far enough so treatment slots, already capped to 220 new patients per month, will be cut in half. Lesotho has an HIV prevalence of 23 percent and a huge health care worker shortage. Less than 4 percent of primary health centers meet minimum staffing requirements.9 To cope, the country has trained and paid lay HIV/TB counselors to take on many tasks—including HIV testing and counseling, symptomatic screening for TB and sexually transmitted infections, adherence counseling, and defaulter tracing—from the nurses who are scarce in number and often overloaded. Without lay counselors it would have been impossible to reach ART coverage of 66 percent. But now external funding for this program is ending this year, and with Round 11 canceled, Lesotho will not be able to pay these lay counselors. With such a severe shortage of nurses, treatment scale up risks grinding to a halt without them. Uganda will not be able to double the number of people newly initiated on ART (to 100,000 per year), as it had planned to do, and predicts it will only be able to continue the same number of new initiations (50-65,000 per year). Coverage of ART is 67 percent according to the MoH as of October 2011. Even with a proposed increase of the portion of a national AIDS levy that raises revenue to fund 26 percent of patients on ARVs today, Zimbabwe cannot shoulder the costs of its ART program on its own. It faces immediate funding gaps due to reduced ARV funding from bilateral donors and the European Union. Round 11 would have at least partly covered the overall shortfall, which leaves more than 60,000 people in 2012 and potentially double that by 2014 without ART. Initiating at an earlier stage of the disease (meaning, when a person’s CD4 count falls below 350 cells/mm) helps prevent opportunistic infections, such as tuberculosis and other illnesses, reducing death, hospitalizations, sickness and complications that ultimately drive up the cost of overall treatment of people living with HIV/AIDS. Recognizing the importance of earlier treatment, countries like DRC and Guinea have taken steps to initiate earlier treatment, but full implementation has stalled in the current funding climate and due to other country-specific challenges. Only 1 percent of HIV-positive mothers have access to ART to prevent their child from being born with HIV. DRC prepared its Round 11 proposal aiming to increase PMTCT coverage. Now that the funding opportunity has been cancelled, the planned scale up of PMTCT will not be possible, at least not before 2014. New national guidelines include life-long treatment for all HIV-positive expectant mothers (an ambitious strategy known as ‘PMTCT Option B+’). This is expected to decrease the mother-to-child transmission rate, which in 2010 was estimated to be as high as 42 percent. The country remains almost entirely dependent on external funding for its HIV response, particularly the Global Fund, which is responsible for most of the country’s HIV test kits and drugs, including ARVs. Malawi had hoped to pay for its national plan of scaling up PMTCT and ART by increasing availability at more than 600 health facilities across the country thanks to Global Fund Round 11 grants. Mother-to-child transmission was the source of 20 percent of new infections in Uganda in 2010, yet PMTCT coverage is only at 50 percent. The government has adopted the state-of-the-art protocol for PMTCT (Option B+), providing all HIV-positive pregnant women with life-long treatment. However, it has only been implemented in pilot sites supported by non-governmental organisations. Uganda had hoped to phase in PMTCT Option B+ using funding from Round 11. In 2006, WHO first called for countries to plan a switch away from using stavudine (d4T) because of its toxicity. But the high cost of better alternatives such as tenofovir (TDF) meant that countries were initially slow to adopt the recommendation. Prices for TDF have since fallen dramatically as a result of generic competition between 2008 and 2011. Thanks to this drop, according to WHO, almost all low- and middle-income countries have changed their guidelines to shift away from d4T. MSF found in a 2011 survey of 16 countries where we work that roughly half opted for a TDF-based first-line treatment and the other half, including Guinea and Mozambique, for example, chose zidovudine (AZT). TDF is preferable to AZT. One of the advantages over AZT is that it does not cause anaemia, and in MSF’s project in Lesotho, patients on AZT were more than twice as likely to require a toxicity-driven regimen substitution compared to TDF. Unlike AZT, TDF is available as a once-daily fixed-dose combination (FDC), which has been associated with better patient adherence compared to multiple pills29 or twice daily regimens. The country has faced difficulties getting funding to help pay for TDF and, with Round 11 being cancelled and in the absence of alternative donor support, the country will continue rationing TDF for specific groups only, such as newly-diagnosed HIV-positive pregnant and breastfeeding women, patients co-infected with HIV and TB, and those experiencing severe side effects from other ARVs. When the country made the switch in its guidelines away from d4t, it chose AZT due to funding concerns. Now because of growing concerns of the anaemia suffered by patients on AZT and the drop in price of TDF, Mozambique is considering a switch to the better-tolerated TDF-based regimens, though implementation is dependent on securing greater funding. But rules put in place last year due to low funding levels at the Global Fund made Mozambique ineligible to apply for Round 11 grants. The country had already delayed implementation of new guideline change to TDF for preferred first-line for all patients, due to a shortfall of funds to address the large treatment gap. The government is now considering slowly rolling out TDF for preferred first-line for all patients over the course of the next five years. For now, TDF is limited to cases of HIV/TB co-infection or pregnancy, and patients at risk for experiencing drug toxicity. For years, the barrier to diagnosing infants with HIV was technical—infants could not be detected before 18 months of age. However, with the development of early infant diagnosis testing, infants can now be diagnosed as early as six weeks of age, which means they can get on life-saving treatment earlier and are much less likely to be lost during follow up care. Treatment of HIV-positive children is necessary—without ART, half of HIV-positive children will die before their second birthday. WHO recommended ART for all HIV-positive children under 2 years of age in its 2010 guidelines. However, countries haven’t been able to follow suit: only 23 percent of children in need of ART receive it as opposed to nearly half for adults. 6,250 children are on treatment, while 100,000 children are living with HIV. UNITAID funding for paediatrics is ending in 2012 and the current Global Fund grants can only ensure continuation of treatment for a maximum of 6,000 children. Without Round 11, continuity and scale-up of treatment for children cannot be guaranteed beyond 2012. UNITAID’s Paediatric Project, started in 2006, supported scale-up of paediatric diagnosis and treatment in 40 countries. Almost all of the countries supported by UNITAID’s paediatric program have found alternative funding, according to UNITAID, save for 11 countries whose grants are being extended an additional year. Among these countries, Swaziland and Uganda (together with Zimbabwe) were the most reliant on the Round 11 to help pay for paediatric diagnostic tests and HIV treatment formulations. UNITAID grants expire at the end of 2012 and, with the cancellation of Round 11, there is no dedicated funding in place for these children beyond this date which means there will be competition for limited treatment slots under already stretched GFATM grants. UNITAID should accommodate further extension of the paediatric grants until alternative funding is secured, including for countries where grants have already ended but where paediatric treatment remains very fragile. Currently the coverage of paediatric HIV therapy is dismal—only 24 percent of children in immediate need of treatment are receiving antiretrovirals. As part of Kenya’s HIV/AIDS plans, paediatric treatment will be scaled up. 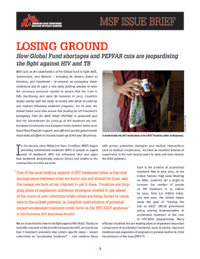 However, with UNITAID’s grant for paediatric treatment having ended last year, and looming cuts to PEPFAR, paediatric treatment scale up is threatened. The country has 150,000 children living with HIV. With support from donors, and particularly UNITAID grants to the Clinton Health Access Initiative, the country was able to expand the number of sites offering early infant diagnosis sites from only four in 2008 to more than 400 in 2010. Due to the lack of secured funding, UNITAID granted a one-year extension to continue paying for paediatric treatment. The country aims to place 51,000 children on treatment as of 2015, but funding gaps are foreseen from 2013 onwards. Zimbabwe’s application for the Global Fund’s Round 11 sought to help fill the gap. The effort to properly address TB and HIV/TB co-infection remains underfunded, mismanaged, and neglected. Access to quality diagnostics (including drug sensitivity testing or DST) remains pitifully low - in many parts of the world less than 5 percent of patients are tested for MDR-TB. Access to treatment is equally insufficient. In 2010, barely 46,000 people diagnosed with DR-TB, or 16 percent of the estimated cases were started on treatment. Programs financed by the Global Fund, following WHO treatment standards, were expected to diagnose and treat about 250,000 MDR-TB patients by 2015. And, without rapid scale-up of TB prevention and treatment, some 10 million people will die of this curable disease by 2015. From 1990 to 2009, TB incidence and mortality doubled. CAR has experienced serious ruptures of HIV and TB medicines lasting for months, with catastrophic impact on patients. In its Round 11 proposal on Health System Strengthening, the country hoped to find support for its weak national programs, most critically to ensure continuity of supply and treatment for patients on TB drugs. Lesotho has the seventh highest TB incidence in the world41 and a TB-HIV co-infection rate of 76.5 percent. There is low ART coverage (below 30 percent) among co-infected patients and little to no integration of TB and HIV services. Nearly 1,000 people each year contract strains of drug-resistant TB. Lesotho was planning to include a TB component in Round 11 to address some of these challenges related to TB care. TB funding depends mainly on the Global Fund. A current grant will last until June 2013, but after that there is no prospect of alternative funding. South Africa currently ranks third highest in the world in terms of TB burden, with a 400 percent increase in incidence over the past 15 years. The main driving factor of the TB epidemic is HIV, as more than 70 percent of TB patients are coinfected. The TB epidemic is further exacerbated by DR-TB. In 2010, there were 7,386 confirmed MDR-TB patients and more than 700 patients with confirmed extensively drug-resistant TB (XDR-TB). Since then, numbers are likely to have increased with improved diagnostic capacity. In 2011, the South African government approved a national roll out of molecular tests for faster detection of drug resistance and was planning to include a TB component in its Round 11 Global Fund grant to help pay for diagnostics and treatment of DR-TB. At least 14 percent of new TB cases and 49 percent of retreatment cases in the country are found to have DR-TB.46 While MSF is able to follow WHO guidelines and offer DST to every person with symptoms of TB in its project in Karakalpakstan, national rollout is nevertheless far from being a reality for many reasons, including funding. As it is, Uzbekistan offered DST only to 18 percent of new cases and 26 percent retreatment cases in 2010. Since offering routine DST, MSF has found the number of “relapse” and “new” patients, meaning those who have not previously received TB treatment, with DR-TB has been rising. Uzbekistan was heavily reliant on prospective Round 11 grants for continued scale-up of DR-TB treatment in 2014 (as well as covering the second year of treatment for patients initiated in 2013), and to fund long-term scale up plans. The strength of the evidence showing the potential of accelerated treatment has never been greater—but the funding situation has never been so grim. Thanks to accumulating data demonstrating the value of ART for both individuals and communities, we have never known more about how to stop HIV. To have any hope of reversing the spiral of new infections and needless deaths, however, all the tools at our disposal must be used. To put the epidemic into reverse, hard-earned progress must not be undone and ambitions for further scale-up cannot be put on hold until 2014. MSF calls on the international community to make a renewed and re-invigorated commitment to turning the tide on the HIV/AIDS epidemic over the next decade, by fully committing to providing the funding needed to implement the knowledge, tools and strategies to realize this ambition. Action against TB must also be part of this effort. The need for greater roll-out of TB diagnostics and treatment to improve care and treatment outcomes for those living with TB, or with both HIV and TB, is all the more urgent. Part of the answer in fighting the two epidemics lies in renewed financial and political commitments, in addition to fulfilling commitments that have already been made. Donor governments must work toward the "15 million by 2015" HIV treatment commitment by supporting a fully functioning and funded Global Fund, which includes providing affected countries with a new early funding window in 2012 to support the expansion of life-saving treatment programs. • Convening an emergency donor conference by mid-2012 to pay for the new early funding window of the Global Fund. The US, UK, France, Australia, and the European Commission are key donors that could make this a reality. • The US government to fully fund PEPFAR so that it can meet its targets of reaching 2 million additional people in need of ART and 1.5 million pregnant women receiving PMTCT by the end of 2013. PEPFAR should also increase its support to TB, including MDR TB diagnosis and treatment. • Affected countries to increase national funding from domestic resources for HIV, TB and other health programs, and to increase the pace of treatment scale-up for HIV and TB and include optimal HIV treatment (earlier treatment with better drugs) in line with international standards. • Governments to support innovative financing mechanisms, including a financial transaction tax, that can raise additional and regular funding at sufficient levels to support HIV, TB, and other global health priorities. • Governments work to ensure medicine costs can be reined in by fully implementing and using the flexibilities in the TRIPS Agreement to ensure access to medicines, abiding by the Doha Declaration on Public Health that puts the primacy of public health over trade, and refraining from pushing measures in trade agreements that harm access to and trade in medicines. Most immediately the flow of quality affordable medicines from India, ‘the pharmacy of the developing world’, must be safeguarded.